Our goal was to calculate annual indices and population trends for all stations that had at least 10 years of hourly data (2002-2012) entered into HawkCount. Sites with less than 10 years are considered to have insufficient data to estimate a trend reliably. Although trend graphs based on very low annual counts are included here, the RPI Steering Committee views trends based on counts less than 20 individuals per year as unreliable and of limited biological value. Because the analysis is now highly automated and depends on access to the data stored in HawkCount, several sites that were included in previous analyses were not included this time due to incomplete datasets in HawkCount, typically, missing hourly data. These sites will be included in the next update (2015) if the missing data has been entered. Note that full-season count data are not necessary for sites to be included in RPI. It is important for users to recognize that the RPI partners do not have the resources or staff to do exhaustive checking of the results. We rely on the sites contributing data to alert us to problems. Results are presented in two formats: trend graphs containing the long-term (when available)�and 10-year linear trends (see trend graphs), and trend maps graphically showing the most recent 10-year trend, in this case for the period 2002 to 2012 (see trend maps). The following example shows the long-term and 10-yr trend for American Kestrel at Cape May (Cape May has the highest Kestrel counts in North America). The subtitle of the plot contains the linear trend values based on both all years of data (1976-2012), and the most recent 10-years (2002-2012) expressed as annual percent change in population index size. These trend values assume a linear change in population size among years over the time period examined. The significance level is expressed by the p value: values of 0.05 or less are generally considered statistically significant (calculation methods for the trend and p value are provided below). Note that in this case there is a highly significant long-term decline, although over the last 10 years the trend is not significant, possibly indicating that the Kestrel population has stabilized in northeastern North America, albeit at a lower level than in the recent past. The black dots on the chart are estimated indices of annual population size as calculated by the statistical model. They are expressed on a linear scale and represent the average of the predicted number of individual birds detected per hour of survey. If present, the blue line represents the linear trend. 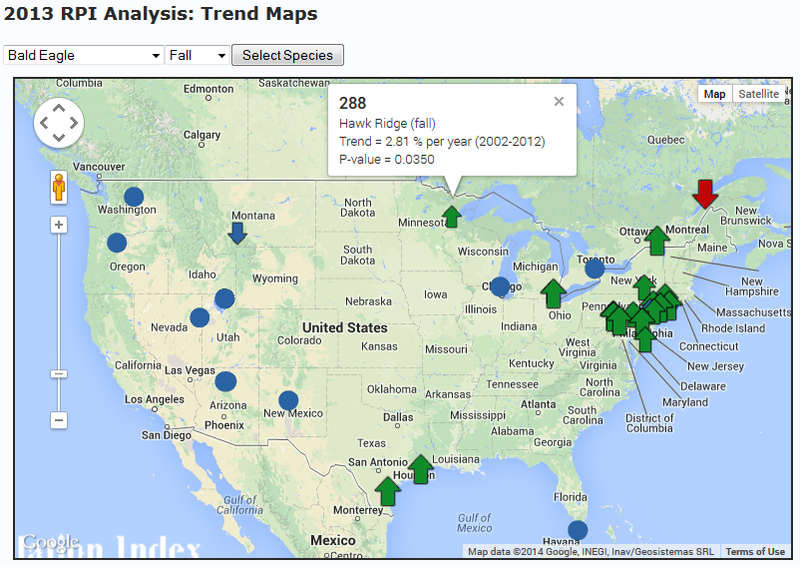 Trend maps combine the trends calculated from all RPI stations to more easily visualize the population trends of a species over a large area. Consistent population trends across sites within a region gives us confidence that the results we see are representative of the underlying population trends. To ensure that all trends are directly comparable, we only used the trend based on the most recent 10 years (2002-2012) for each station. The example below represents the population trends of Bald Eagle based on fall count data. Green up arrows represent cases where the 10-year population trend is significant and positive; red down arrows represent significant declines. Smaller blue arrows (up or down) represent near-significant trends (p value between 0.05 and 0.10), and the blue dots represent no significant trend. Note that the size of the green and red arrows is also proportional to the magnitude of the increase of decline, as explained in the map legend (not shown). You can click on any of the markers to see more details about the station name, the trend and period covered, as well as the significance level. You can also zoom in or out to better see the details in areas where there are several nearby stations, such as along the Appalachian Mountains. Clearly Bald Eagles are doing very well in the east but appear to have stabilized in the west where counts are generally much lower. Annual population indices and long-term population trends were estimated using Generalized Additive Models with Poisson distribution and log link (mgcv package, R-Project 2010). Additive Models were first described in the 1980â€™s (e.g., see Hastie and Tibshirani 1986), and are an extension of Generalized Linear Models, first described in the early 1970s (e.g., see Nelder and Wedderburn 1972). where g() indicates a log-link between the mean of Yijk and the predictor function for the Poisson model; Yijk = hourly observation count (number of hawks per hour) in hour i, on day j, in year k; Î±k is the intercept (year factor) for year k; X1ijk = day of year (Julian date); X2ijk =, hour of the day; f1 and f2 are smoothing functions for day of the year and hour of the day, respectively. Cases were weighted by W = the ratio of observation length (typically one hour, but sometimes less than one hour) to total number of observation hours each year. The trend was calculated as the % rate of change per year = 100*(exp(Î² )-1). This converts the year coefficient, which is an estimate of the instantaneous rate of change per year, to an estimate of the discrete rate of change per year between any year and the next following year. Because the p-value for the year coefficient is overly-optimistic using generalized linear and additive models (degrees of freedom are based on the number of observations as opposed to the number of years, incorrectly resulting in highly significant effects), we used an alternative method based on Monte Carlo simulation to estimate a p-value for the trend. To do so, each dataset was re-analyzed 1000 times, with the year term randomized each time without replacement. This tested how many times out of 1000 a trend larger than the year coefficient from eq.2 was achieved, essentially providing a probability that the trend was significantly different from zero. T. Hastie and R. Tibshirani. 1986. Generalized Additive Models. Statistical Science. 1(3): 297-318. J.A. Nelder and R.W.M. Wedderburn. 1972. Generalized Linear Models. Journal of the Royal Statistical Society, Series A (General). 135(3): 370-384. Annual indices and trends can also be downloaded from NatureCounts in an Excel compatible format, if you wish to create your own graphs for presentation. Simply look for the Download button of the population trend tool on NatureCounts.